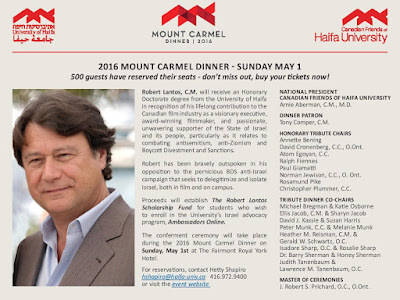 The Haifa University Mount Carmel dinners are always lovely and tasteful affairs and always honour a substantial and deserving figure. I attended the dinner in which the great Jason Kenney was the honouree and it was a wonderful evening. If you are in Toronto May 1st and want to support a very good cause, do consider attending! This year's honouree is Robert Lantos, click here for more info. I'm sure it's going to be a great night.